Introduction: Gena Philibert-Ortega is a genealogist and author of the book “From the Family Kitchen.” In this guest blog post, Gena provides a handy tool to help with your family history research: a checklist of 13 types of genealogy records that you can use for each ancestor you search for, to make sure your research is thorough. After conducting online searches through your favorite genealogy websites, you may feel like you’ve hit a brick wall. This is understandable—it’s easy to become overwhelmed with multiple databases and lose sight of what sources might help you answer your research question. Before you decide you’re facing that brick wall, consult this checklist of frequently-used family history sources. A checklist of sources can help you plan out your research and keep track of where you have searched. Print this out for each individual you search for, and refer to it as you research your family history. 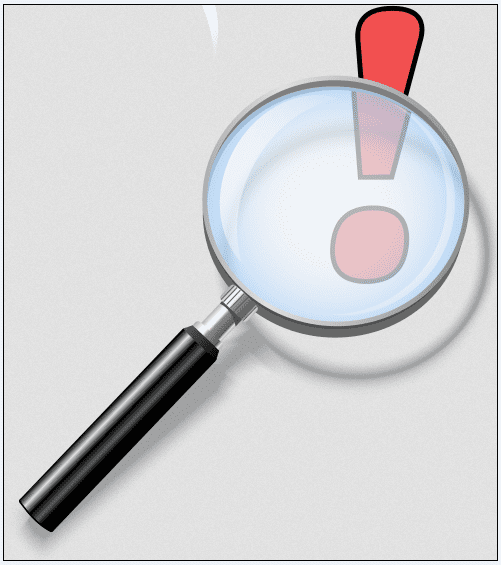 Illustration: magnifying glass. Credit: Wikimedia Commons. One of the first places we often look for our family is in the U.S. Federal Census. The census should be your go-to source for trying to place your ancestor in time. The census was taken every 10 years starting in 1790. (However, the 1890 census was largely destroyed.) Because of privacy concerns, the latest census you can access is 1940. As you think about your ancestor in the census, don’t forget that other census schedules exist aside from the familiar population schedules. Depending on the year, you may also want to consult the Mortality, Agriculture, Slave, Veterans and Defective, Dependent and Delinquent schedules. Also take a note if the state your ancestor lived in conducted a state or territorial census. Not every state participated in such a census and in some cases a state may have only conducted one when it was still a territory, but a state census can often yield additional information not compiled in the federal census. What religion was your ancestor? This is important, especially considering that in some cases a religious record might take the place of a civil registration. What records should you look for? The answer is: it depends. It depends on where your ancestor lived, what religion they practiced, and what still exists. Records that might exist include those that document baptisms, christenings, marriages, and deaths. Other religious records include: cemetery records, school records, censuses, meeting notes, membership lists, pew deeds, adoption records, excommunications, church periodical articles, directories, and church auxiliary records. Exhaust religious databases found online like the selection found at JewishGen. To find church records, consult the individual meeting house and then archives associated with that religious community, including academic institutions and seminaries. Also, consider conducting a place search in the Family History Library Catalog. Even if you think your ancestor would have no interaction with the local court, don’t overlook searching at least the civil case index for their name. Our ancestors were involved in all sorts of legal matters, and it’s a myth to believe that only our modern society is “sue happy.” Some items to look for include minutes, orders/decrees, judgments, case files, indexes, criminal proceedings, naturalizations, and divorce petitions. Learn more about what court records exist by reading the book The Researcher’s Guide to American Genealogy by Val D. Greenwood. Note that you can also find court case files and courtroom transcripts in GenealogyBank’s newspaper archives. Death results in a lot of paperwork. Sure, there’s the death certificate—but that’s just the beginning. There can be paperwork from the hospital, funeral home and cemetery. What other paperwork can be found? Death certificates, newspapers (including articles, legal notices, funeral notices, death notices and obituaries), funeral home records, pension records, church records, cemetery records, court records (to include a will or probate or in the case of an accident there might be a lawsuit), Coroner’s Inquest, city directories, and the Social Security Death Index. Notices from membership directories and publications may also offer clues. Every genealogy project should begin with home sources. These are the heirlooms and “stuff” inherited and passed down through the generations. Sometimes just talking about your interest in genealogy will alert family members that you would be a grateful recipient of items that they have inherited. What are some possible home sources? Correspondence, newspaper clippings, photos, scrapbooks, diaries and journals, family Bibles, naturalization paperwork, funeral home cards, and work- and school-related papers. As you try to find home sources, don’t forget to use social media to connect with long-lost cousins who have also inherited heirlooms. Did your ancestor own land or a home? You’ll want to search for a grantee/grantor index, deeds, mortgages, patents and grants. These records can be found anywhere from the Family History Library, a local courthouse or a county recorder’s office, to the National Archives. Make sure to plan out what you are looking for and search online for what entity has that record. Let’s face it, a birth or marriage can result in all kinds of documentation. Everything from home sources (think baby books and photo albums filled with greeting cards and descriptions of the big day), to official government records (vital record certificates) and church records. Don’t forget newspaper articles about the actual event (birth or marriage) as well as articles about the engagement, elopement or milestone anniversaries. Marriage records that could exist include: banns, bonds, licenses/applications, and certificates. Did your ancestor serve in the military? If they were a soldier at any point, think about searching for military service records, pensions, bounty land grants, awards, draft registrations, unit histories, battle histories and maps. Been told that all of your ancestor’s military records burned? Make sure to check for a Final Pay Voucher and ask your recent vets about the DD214 which lists information about their service including awards earned. Many of the life events we have mentioned were reported in newspaper articles. But don’t forget that your ancestor could be mentioned in all parts of the newspaper, including legal notices, advertisements, society pages, crime reports, and other general articles. Not sure what types of articles exist? On the GenealogyBank Blog we focus on a variety of newspaper articles and how they can assist your genealogical research. Even if your ancestor was “just a farmer,” an occupation can leave behind a paper trail. Consider items like paycheck stubs, occupational periodicals, union records, membership cards and records to professional groups. Mentions of occupations can also be found in the city directory. There are many different types of published sources that can assist you throughout your family history research. In some cases, like that of unsourced family history books, they may be just a place to gather initial clues. In other cases, however, they can provide you with definitive information to confirm your ancestor’s place in time, such as city directories. Make sure to consult biographical works on your ancestor or their associates, county and local histories, and periodical indexes like PERSI, Google Scholar and JSTOR. What schools did your ancestor attend? Even if they only attended for a few years, records may be available. Consider what may be available from attending an Elementary, Secondary, High, or Vocational/Trade school, as well as a College or University. Papers may in some cases be found in the home, but also could be found in an archive or the Family History Library. Look for yearbooks and alumni directories, school newspapers, articles about school awards and events in local newspapers, award certificates, report cards, and school census records. We all know the saying “nothing is certain but death and taxes,” and that is as true for us now as it was for our ancestors. Why search tax records? They can not only establish a place in time for your ancestors, but they help you better understand their lives. Some ideas about tax records that could exist are: poll, personal property, real estate, income, federal, inheritance, and school taxes. Don’t forget that the newspaper also printed lists of those who were negligent in paying their taxes. Is the above list of 13 genealogical sources totally comprehensive? No, of course not, but it provides a handy reference for your family history research. As you plan your genealogy searches, also consider what libraries, archives, and museums exist where your ancestor lived. They may have catalogs that will provide you with additional sources that you may not have known existed. You can either print or create a PDF version of this Blog post by simply clicking on the green “Print/PDF” button below. The PDF version makes it easy to save this post on your desktop or portable device for quick reference—all the links will be live.